To start 2018, we revisited this important category to see what had changed in the world of budget classical guitars. The guitars at the top of our chart remained same, although we removed both the Lucero LC100 and the Lyons Classroom Guitar, and replaced them with two newer offerings – the Squier SA-150N and the Classical Guitar by Hola! Music. We can all dream of owning an American-made model from Cordoba’s prestigious Master Series… until we check our bank balances and realize we can’t even afford the strings for it! What to Look for in a Cheap Classical Guitar? But fear not – if you are on a strict budget, there are still some excellent classical guitars worthy of your time and money. On this page, we have highlighted five of our favorite affordable guitars in the current market. There may be several reasons for wanting a cheap guitar. If you’re a beginner, you may not want to spend much more than $150 because you may not be sure whether or not you’ll stick with the instrument. If this is the case, don’t forget to check out our page dedicated to classical guitars for beginners. Maybe you’re a parent purchasing a guitar for your teenager to take to and from school? Or you may be an experienced classical guitarist looking for a budget model to leave around the house / in the car / travel with. If you drop, damage or lose a guitar that didn’t cost much, it’s not the end of the world. Rather that, than your $1,000 Kremona! Whatever your reason for wanting an affordable model, you don’t have to settle for ‘cheap and nasty’. 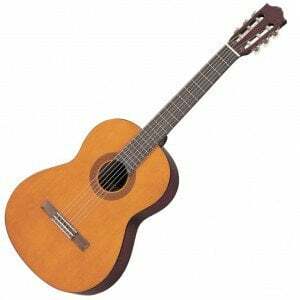 We’ve sourced classical guitars that are ‘cheap and cheerful’. Here’s our top five. The C40 offers an authentic classical design on a budget. The perfect way to explore the nylon-stringed guitars. This Ibanez is a great example of how affordable guitars should look like. + - Classical Guitar by Hola! Superb style, quality and sound – perfect for beginners and experienced players alike. An attractive wallet-friendly classical guitar from budget kings Squier. Are you really surprised to see Yamaha on a list of quality budget guitars? You shouldn’t be, because they are masters in this area. And this popular nylon-string C40 is an excellent offering from the Japanese manufacturers. It sports an authentic classical design, with a spruce top and meranti back and sides. The neck is made from nato, and connected to the body with a dovetail joint. The guitar offers a full range of classical tones, and is warm and resonant making it perfect for classical and jazz styles. For such an affordable price, you get an instrument that can offer an excellent playing experience, and one that will accompany you for years to come. You can find more details in our review of the C40. Cordoba’s CP100 is a fantastic affordable startup nylon-string guitar that comes bundled with a range of essential accessories, including a travel gig bag, a digital clip-on chromatic tuner, plectrums, and a tutorial book. The guitar in this great value set has a beautiful pale, satin-finished look, with a spruce top and nato back and sides. There’s also a good rosewood bridge, and a nato neck with rosewood fretboard, which is wide and easy to play. 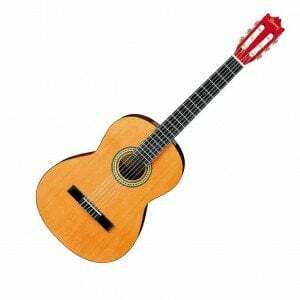 The guitar provides a mellow sound with good projection, that’s more than suitable for beginners. It looks great, and the craftsmanship – for such a ‘cheap guitar’ – is very notable. This convenient pack (which is reviewed in full here) offers beginners everything they need to start playing. Although they have rock in their hearts, Ibanez show off their classical side with this super affordable GA3 – with style, tone and attitude in equal measure. With a traditional classical body, the guitar is crafted with a spruce top, and agathis back and sides, finished in a natural high gloss with a classical mosaic rosette. The eye-catching Ibanez-branded red headstock features chrome classical tuners, and sits atop a mahogany neck, with rosewood fretboard – all comfortable to use and offering easy playing. This attractive guitar is clear and well-balanced in sound, and would work well for a beginner learning their first chords, licks and riffs. Take a look at the full review to find everything you need to know about the GA3. While there’s no big brand name behind this affordable guitar, there’s a lot of quality on offer – as we highlight in the full review of the Classical Guitar by Hola! Music. It’s a full-size classical guitar, sporting attractive traditional looks and featuring a spruce top, with mahogany back and sides. There’s a good mahogany neck, fitted with a rosewood fretboard and the typical 19 frets. Hardware matches the style and playability of this guitar, with a decent set of open-gear tuners, a rosewood bridge, and a Tusq nut and saddle. Heading to and from guitar lessons is no problem either, as the guitar comes bundled with a padded gig bag. For the price, it’s hard to fault this impressive model! When it comes to cheap guitars, Fender’s budget subsidiary Squier know how to make something that impresses, and this SA-150N (available in both jet black and natural finishes) has plenty to offer both beginners and experienced players alike. It’s constructed entirely of laminated wood, with lindenwood on the top, and mahogany on the back and sides. Joined at the 12th fret, the mahogany neck is wide and slim, which gives players lots of space to maneuver, and offers a painted maple fretboard with 18 frets in total. Hardware on this model is nothing to write home about, but it does the job with a set of traditional open-geared tuners and a rosewood bridge. For more on the Squier SA-150N, check out our full review. Whether you’ve skimmed the summaries or read each review in depth, you’ll now see that you don’t have to spend over the odds to find a classical guitar that marries affordability with a decent level of quality. Unlike having, say, $300 in your pocket, you aren’t spoiled for choice when it comes to woods, components and tones in this budget bracket – but there are still some things to look out for. Whereas the steel-string acoustic and electric guitar markets are awash with a nearly endless stream of designs, the classical market is notably more traditional in appearance, and the budget end is usually no different. In fact, trying to tell a $1,000 model apart from a $100 guitar based on a photo is not always the easiest thing to do! In this budget market, you can find different colored guitars (black in particular), but nothing beats a classic natural finish. As for materials, you’ll usually find laminated woods on cheaper guitars, especially those under a hundred bucks, but in some cases, you can find a cheap guitar with a solid top. This allows for a much more robust sound, and adds to the value and longevity of the guitar. Where possible, avoid plastic components (and we’re talking basic, cheap plastic, not higher-tech plastics such as TUSQ, Corian or Micarta). It shouldn’t be a deal-breaker, but if you have the option to avoid it, do so. For example, aside from cheapening the look of your guitar, a plastic nut isn’t particularly durable and will usually hinder your tone. If the guitar does come with a plastic nut, consider upgrading it. Before we go, we should point out that having your new guitar professionally set-up by your local guitar pro is worth considering – unless you are experienced enough to do it yourself. Ask them to change your strings, lower the action a little, and ensure it’s all playing and sounding as good as it can. This can make a cheap instrument feel a lot more expensive. Although make sure to have a quote from them first – if the set-up ends up costing more than the guitar it’ll all be a bit pointless! This is the most volatile market, because for every good guitar under $150, there are 10 poor models. It’s worth sticking with a name you know (Yamaha, Ibanez, Cordoba and Epiphone tend to be good bets), and if possible try the guitar out before you buy. Otherwise read some reviews and look at a few videos, which will give you a sample of what they sound like. Keep checking back because we refresh our lists often and a more expensive model may eventually slip into this budget category. Good luck with your hunt!